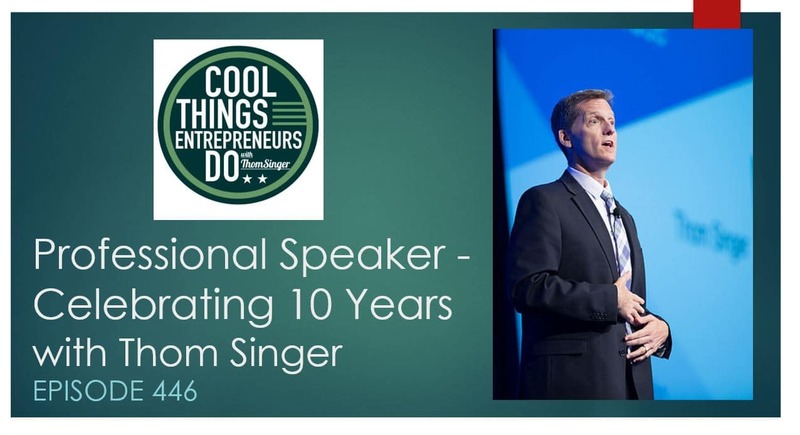 April 1, 2019 marks ten years since Thom Singer became a full time professional speaker. This is a big milestone, as for a decade he has had no other job or income source. Thom is proud of the work he has done in the meetings industry. He was laid off from his corporate marking job on the first day of April in 2009 (the bottom of the Great Recession), and he has never looked back. The journey to being and entrepreneur has been difficult. When he was let go from his job he knew there were not many opportunities in marketing available, so he decided to jump in full time to making a go at professional speaking. This is not an easy profession, as it is a mix of skills, marketing, reputation, and industry engagement. Being a professional speaker was something he had dreamed of doing. While working in a career in sales and marketing he had attended a lot of events that featured motivational speakers and other thought leaders. Because he was not sure he was in the right job, he would watch these presentations and think “They have a cooler job than I do”. He began interviewing professional speakers and meeting planners about what it took succeed in the business. Without job options, he had not choice but to follow his dream. In 2009 he went full steam ahead into a career as a professional speaker. Because times were tough, most companies were canceling meetings. But associations were moving ahead with their annual conferences and Thom’s topic of how to connect better was ideal for these events. Most industries were feeling the economic pinch, and their members needed to know how to network if they wanted to have job opportunities. Thom had a lot of support from family and friends in his leap into being a professional speaker. Many people in his network went out of their way to make introductions to companies and associations that hosted meetings and got him considered for the keynote speech. There were so many speakers who showed Thom how to succeed in the business of speaker. From his first NSA conference he developed friendships and found mentors. Thom has long taught people to get involved in their trade associations, and his message is not without personal experience. Because all opportunities come from people, becoming engaged with successful professional speakers was key to figuring out how to navigate the industry. In this episode of “Cool Things Entrepreneurs Do” Thom shares his journey. He openly talks about the ups and the downs of the last decade. Check out Episode 446 and hear Thom Singer tells his story about becoming a professional speaker and sustaining that for over ten years. Thom Singer is a funny keynote speaker and a professional EmCee. He is the host of the “Cool Things Entrepreneurs Do” podcast and the author of 12 books. He can be booked directly at www.ThomSinger.com or via your favorite speakers bureau.